Cyril Coy, photographed post-WW1 in the uniform of the Durham Light Infantry wearing his medal ribbons, 1917. Personal family collection of Mr Iain Coy. Cyril Coy was the brother of William Herbert Coy who died on 8th August 1917 and is remembered on the Muston War Memorial. Cyril Coy was born on the 12th April, 1899, in the hamlet of Stenwith, near Barrowby in Lincolnshire, son of Mr and Mrs Henry Coy who lived at Breeder Hills, Stenwith. Henry Coy was born in nearby Woolsthorpe in 1861, and his wife Sarah Smith was from Coston, Leicestershire. The couple were married in 1884. In 1901, they were living in one of three cottages at Breeder Hills, where Henry Coy worked as an agricultural labourer. The children living at home were Mary Ann (aged 12), Harriett (10), Susan (8), William (6), Lizzie (4) and Cyril (1). By 1911, Henry Coy was working as an ironstone labourer and the family lived at Mary’s Row in Muston. The older children had left, but Lizzie, Cyril and two younger sons, Albert and Cecil. Henry Coy was working as an ironstone labourer. Twelve years old Cyril was at school in Muston. Cyril Coy did not reach eighteen until 1917, but there is reason to believe he had the chance to enlist when under-age: the Bates family tree (Ancestry) records that he first ‘joined up’ in 1914, but it is not clear what exactly this involved. Was he a part-time trainee? Few of his service records have been located, but there are a Medal Roll record and Medal Index Card which both state that he was 5/66802, 52nd Graduated Battalion, Durham Light Infantry, then later re-designated as Private 90937, 11th Battalion, Durham Light Infantry. The 52nd was indeed a training battalion, so it seems likely that he was obliged to remain in this unit until old enough to transfer to a regular fighting unit. In the Absentee Voters list of 1918 he was entered as belonging to the 11th, his home address at Muston Gorse farm. He was awarded the Victory Medal and British War Medal. No further details of his war service have been found. It is however quite probable that he would have been involved in the fierce battles of the German ‘spring offensive’ of 1918, in which allied casualties were high, including Private Philip Sutton, cousin of Edith Sutton (who Cyril married after the war), who was killed in action on the 24th March 1918. Cyril Coy was the brother of William Herbert Coy who died on 8th August 1917 and is remembered on the Muston War Memorial. 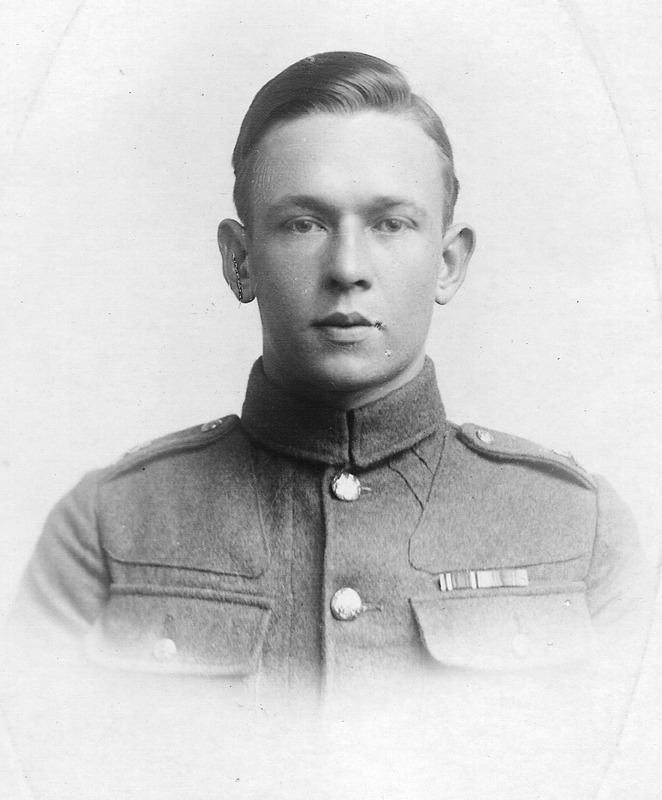 His younger brothers Walter, Albert and Cecil would have been too young to enlist during WW1. On the Electoral Roll of 1924, five members of the Coy family were registered as living at Muston Gorse, by the canal; Henry, Sarah, Cyril, Arthur and Walter. Later that year, on the 11th December, Cyril Coy married 21 year old Edith Jane Sutton, at Bottesford. She was a daughter of Philip Sutton (uncle of the Philip Sutton who was killed in 1918). They went to live at Blue Bank cottage, Bottesford. In the 1926 Electoral Roll, only Cyril is registered at Blue Bank, but his wife was probably not eligible to register to vote at that date. Cyril Coy died in September 1940, aged 41. He was buried 31st July, 1940, in Bottesford churchyard.